Walker Bridge No 59 is a minor waterways place minor waterways place place on the waterways major waterways place village town city on the Rochdale Canal between Ducie Street Junction (Junction of Rochdale and Ashton Canals) (12 miles and ¼ furlongs and 35 locks to the southwest) and Littleborough (3 miles and 1½ furlongs to the northeast). The nearest place in the direction of Ducie Street Junction is Moss Upper Lock No 49; 2 furlongs away. The nearest place in the direction of Littleborough is Kingsway Bridge No 58b; 1 furlong away. Helmsman Lane, Rochdale, OL16 5PS — 234 yards to the southeast. 83 Broad Lane, Rochdale, OL16 4PR — 1225 yards to the south. Helmsman Lane, Rochdale, OL16 4PS — 229 yards to the southeast. Drake Street, Rochdale — 1386 yards to the west. 14 Tweedale Street, Rochdale, OL11 1HH — 1438 yards to the west. Rochdale — 1614 yards to the west. Belfield Lane, Rochdale, OL16 — 1226 yards to the north. Batley — 1433 yards to the west. Moss Bridge Road, Rochdale, OL16 5PQ — 102 yards to the north. Manchester — 1321 yards to the northwest. Station Rd, Rochdale, OL11 1 — 1170 yards to the west. Manchester — 224 yards to the southwest. Unit 2b, Kingsway West Business Park, Rochdale, OL16 5LX — 32 yards to the southwest. Rochdale — 1388 yards to the west. 10 Crompton Avenue, Rochdale — 1495 yards to the south. 4 Baron Street, Rochdale, OL16 1SJ — 1429 yards to the northwest. Kingsway Business Park, Mossbridge Road, Kingsway, Rochdale, OL16 4UX — 116 yards to the east. Eagle Technology Park , Queens Way , Rochdale, Manchester, OL11 1TQ — 1254 yards to the southwest. Water Street, Rochdale, OL16 1TL — 1400 yards to the northwest. 15 Drake Street, Rochdale, OL16 1RE — 1628 yards to the northwest. 77 MILKSTONE ROAD, Rochdale, OL11 1NT — 1200 yards to the west. Moore Street, Rochdale, OL161QN — 1417 yards to the northwest. Entwistle Road, Rochdale, OL162HZ — 1484 yards to the northwest. MILNROW, Manchester, OL165LB — 256 yards to the west. Maclure Road, Rochdale, OL11 1DN — 1176 yards to the west. smith street, Rochdale, OL12 1XU — 1566 yards to the northwest. Kingsway Business Park, Rochdale, OL164FW — 70 yards to the southwest. Rochdale — 207 yards to the southwest. 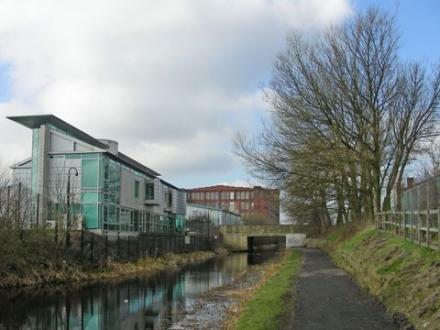 Lock 50 Business Centre Oldham Road, Rochdale, OL16 5RD — 1130 yards to the northwest. Albion Park, Warrington Rd, Warrington, WA3 5PG — 168 yards to the north. Turf Hill Road, Rochdale, OL16 4XA — 401 yards to the south. Unit 3N, Moss Mill Ind Est, Rochdale, OL16 5LB — 277 yards to the southwest. Rochdale — 1310 yards to the northwest. Crossfit Northern SoulApocalypse training systems, FailsworthRochdale, M359BGOL114EE — 1414 yards to the southwest.